Dallas, TX, February 26, 2019 --(PR.com)-- DSGSS today announced a new strategic partnership program with the New Jersey Coalition of Automotive Retailers (NJ CAR) to offer its members a valuable digital compliance enforcement platform. Dealers across the country continue to search for efficient ways to monitor the ever-growing number of compliance obligations, when it comes to safeguarding their customers’ personal, non-public information. The industry requires both speed and transparency. Without the necessary checks and balances in place on every transaction, regardless of whether it starts in the showroom or over the web, the liabilities for non-compliance are substantial. The DSGSS Platform assures that, from the time a customer enters the showroom through completion of a sale, each customer’s personal, non-public information is controlled and safely secured in a “digital deal jacket.” The DSGSS Platform eliminates those unwanted sales process shortcuts or inconsistencies that create concerns about unauthorized access to paper copies of driver’s licenses, credit applications, and other private information. Judy Vann Karstadt, CEO of JV Solutions LLC has been training and implementing the Safeguards Rule and the Red Flags Rule in dealerships since 2008. “I have conducted training for hundreds of dealership employees over the last 10 years. Compliance training is very important, but having the tool to insure a compliant sales process was hard to find. 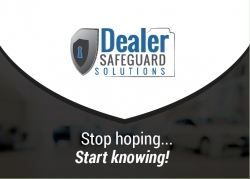 Dealer Safeguards is the solution to ensure the dealer’s policies are followed on every consumer and customer who gives your salesperson Non-Public Personal Information in a safe, secure format. As the Director of Training for the NJCAR Academy I am thrilled about the strategic partnership of NJCAR and DSGSS."